Breq is both more than she seems and less than she was. Years ago, she was the Justice of Toren–a colossal starship with an artificial intelligence linking thousands of corpse soldiers in the service of the Radch, the empire that conquered the galaxy. This book was provided for me to review by the publisher. Few things are more challenging than figuring out how to write a review for a book that I really didn’t enjoy at all, or a book that I loved so much I can’t even put it into words. I rarely face those dilemmas, because it is rare that a book wows me this much, or disappoints me that much. However, today I am floating in that boat. I have no idea how to write this review and I have no idea how to accurately portray and present my feelings regarding it. I LOVED THIS BOOK. LOOOOOOOOOOOOVED IT. LOVE. BLISSFUL RAPTUROUS LOVE. LOVE LOVE LOVE. I WANT TO MARRY THIS BOOK. If that’s enough for you, you can stop now. What I’m going to attempt to do is tell you all the reasons Ancillary Justice was one of the best books I’ve read all year, tied with Love Minus Eighty for impressiveness. Ancillary Justice is the kind of SciFi that I love. It’s technology, new and unique worlds, fantastic cultures, foreign concepts, and a gigantic mind trip with an added dose of deeper, thought provoking themes for good measure.. Case and point: the gender confusion that seems to infuse the book. The default pronoun is “she,” until Breq is absolutely certain of a person’s gender, which takes some time. This might seem confusing, as Breq continually refers to characters as “she” and then another character will come in and talk about the same “she” in “he” terms. Hell, it is even confusing to try to explain it. The fluid and often changing use of “he” and “she” was incredibly refreshing, and can lead to some unique perspectives on what is happening. It’s interesting to have our preconceived notions of the proper roles and abilities of a “he” and a “she” stripped and thrown away. Leckie uses these fluid gender terms to strip away preconceived notions and force the reader to evaluate the character based on their actions, rather than their gender. One Esk (ie: Breq) is one of the most fascinating characters I’ve ever had the honor to read about. Breq is an ancillary, which basically means that she’s a sort of slave to the empire and has numerous live bodies with which she functions. Breq reads like a machine, in fact, she is a machine in some respects. She is rather divorced from the spectrum of emotions that we are familiar with, and can seem almost flat at times of intense emotion. She’s incredibly analytical and very powerful. However, her machine-like nature makes her a different character than you’d typically enjoy reading about. On the other hand, Breq can seem almost childlike in her habits, like her frequent giving candy to children, which she seems to take an obvious pleasure with doing, or her singing and her odd habits of making her various bodies harmonize in courtyards where they are standing watch. Breq, and her multiple bodies, allows Leckie to tell the story in first person, while giving the reader multiple viewpoints on any one situation, all nicely funneled into one thought stream. This, however, does take some getting used to. Leckie takes time setting up the novel. Ancillary Justice does not start out with a bang. The fluid use of gender and the unique ancillary perspective(s) can get confusing. The chapters switch between “now” and “back then.” The time span covered is staggering. It does get confusing. It might require some re-reading of passages to get things straight, but Leckie is a deft storyteller. She gives her readers the time they need to get everything sorted and understand what happened, and what is happening. Once she reaches the point where she thinks she can really let go and readers will be able to keep up, she takes off like a bat out of hell. It’s a slow burn novel, but one of the rare slow burn novels that really needed that slow burn. Breq’s unique situation (ancillary) gives her a one-of-a-kind insight about how to achieve what she is out to achieve (sorry, I’m trying to avoid spoilers, so vague terms is all you’ll get). Due to situations in the past, Breq is a flawed creation as she executes her mission. This is reflected in a lot of her inner dialogue where she will mention that at one point in time there were more of her, but now there is only one, and how this is a disadvantage regarding (insert situation here). It’s subtle but it’s there, and it gives this incredibly powerful character a distinct crack in her armor that seems to make everything she accomplish that much more difficult, and that much more profound, without really taking away any of her edge. Breq is hard to relate to, which is one of the things that I love about her, but her flaws make her sympathetic and her oh-so-human desire to accomplish what she wants to accomplish makes her seem less “other” and more like you and me. Leckie is one of those authors who can make an entire planet and culture spring to vibrant life with a few well-crafted sentences. The worlds are foreign, the cultures are strange, the people are even stranger, the situations are complex and very political, but Leckie’s writing is up to the task. That’s the kind of description I love. Fluid, beautiful, woven together deftly, and so filled with imagery that the whole place springs to life and I can even smell the sulfur smell (aided by my proximity to the Great Salt Lake, which fills the valley with that exact delicious smell every time a storm blows in.). Luckily enough, Leckie isn’t one of those authors that just peppers her book with gorgeous imagery. No, it’s a consistent trait of her writing. Well, my dear readers, it might be stupid, but the truth is, I try very hard not to give away anything about the books I review, and half of the joy of Ancillary Justice is puzzling it out yourself. The thrill lays in being absolutely confused, and learning everything as you go, while letting Leckie guide you through her complex, twisted, psychological, political, delicious far-flung future universe. The plot is fantastic. The set up is expert. The world building is some of the best I’ve ever read. The prose blow me away. Breq is confusing, distant, hard to relate to, flawed, fractured, and deep. And I love her. Leckie’s ability to take assumptions, like the assumption of traits that go with “him” and “her” and light them on fire, is only part of the thrill. Ancillary Justice unabashedly plays with the qualities that make us “human” and “alive” in a captivating and creative way. Leckie is one of those authors that burned herself into me. 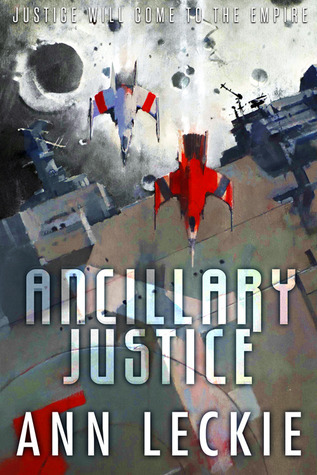 Ancillary Justice is a novel that is a joy to explore. It’s one of those books that makes me almost glad that cancer killed my memory because now I just have to wait a few months and I’ll read it for the first time all over again. Whatever else this review says, the truth is that Leckie isn’t writing fast enough for my taste, and if this book isn’t nominated for awards, no one is getting brownies from me. The novel just *works* on a number of levels, small to large. Agreed. I think a hallmark of a great book is a book that does work on multiple levels. I can say if your blogger award thing ever takes off, this book seems to be a run away favorite for book of the year. Sure is getting a TON of hype, though in this case I think deservedly so. Yeah, this one is getting abnormally rave reviews. Its great to see a book so widely well received. Glad to hear I’m not the only one who was confused. I’m still early on, but I only have a slight grasp on what’s going on in the flashback. Lots of names too, which I hope clears up when it matters. It could be I need to read less books at one time, but I was too excited, after other similarly glowing reviews, not to start right away. Yeah, the first bit of it was confusing. The names did get jumbled up, but it does clear up. This is one of those books that requires some effort, but is well worth it. Holy crap. I received a copy of this book for Christmas this year and just read it in about three days (which is nothing for you, I know, but is crazy for me). And the whole time I was reading it, I kept thinking “Wow…Sarah would probably Love this book!” So when I finished it, I had to pop right over to BWB and see if it was in your review list. I found it, of course, and was quite confused by the rating before I clicked to the actual review. I thought it must be a typo for a 1 or 2 star rating and it disappointed me. I usually agree with your assessments. *lol*. But Ivsee now that you loved it even more than I expected. I plan to get Sword asap.